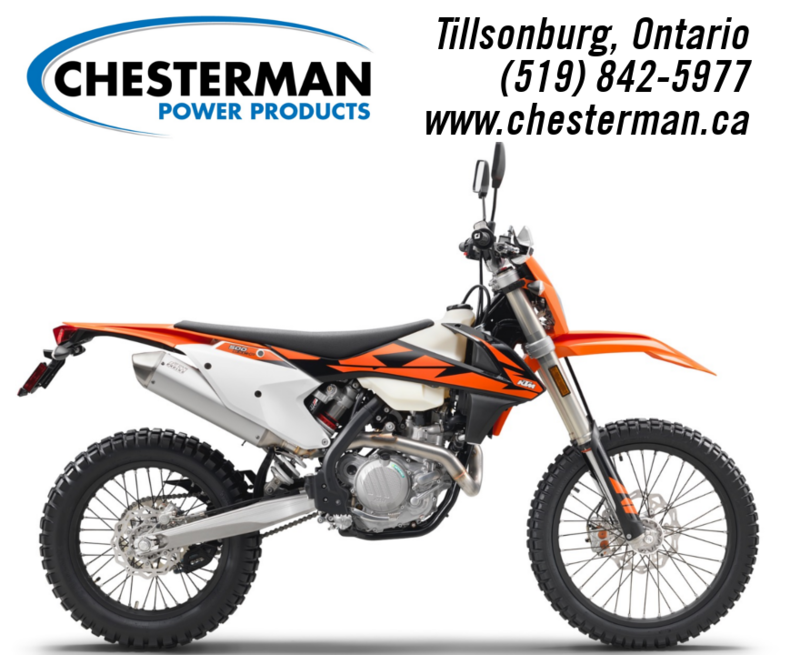 Powered by a 510.4 cc SOHC engine, the 2018 KTM 500 EXC-F has no equal in the dual sport realm. This compact powerhouse is fitted in a lightweight chassis suspended with a revised WP-developed Xplor fork and shock for the ultimate in handling and control. 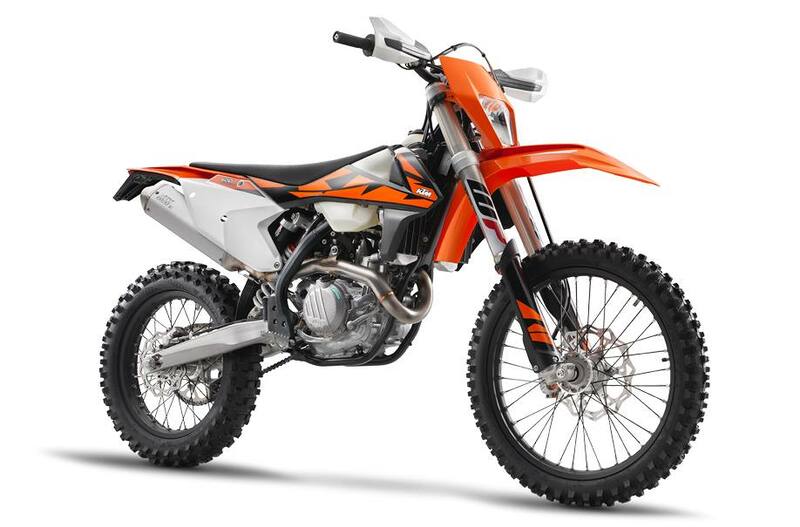 With enough power and torque to dominate the trail and eat up miles mixed with a READY TO RACE chassis, the 500 EXC-F is free of compromise.  UPDATED WP Xplor 48 upside-down split front fork with new outer tubes for more sensitivity, less stiction and reduced weight. Revised settings are stiffer as well.  UPDATED WP Xplor PDS rear suspension features stiffer settings while still offering the progressive feel and excellent bottoming resistance only PDS can provide.  The 510.4 cc engine has been designed in order to be the most compact and lightest 500 cc on the market.  Engine cases with a centralized shaft configuration to move the crankshaft closer to the bike’s center of gravity for light handling.  42mm Keihin throttle body for instant throttle response and crisp fueling.  6-speed wide ratio transmission is perfectly suited for off-road duty.  PDS Shock mounting geometry is matched to the aluminum swingarm with a centered location for nearly symmetrical loads to the swingarm.  Forged aluminum triple clamp with handlebar positions and a 22mm offset for precise handling.  ODI grips that feature a lock-on design for the left grip and a vulcanized grip on the throttle side. 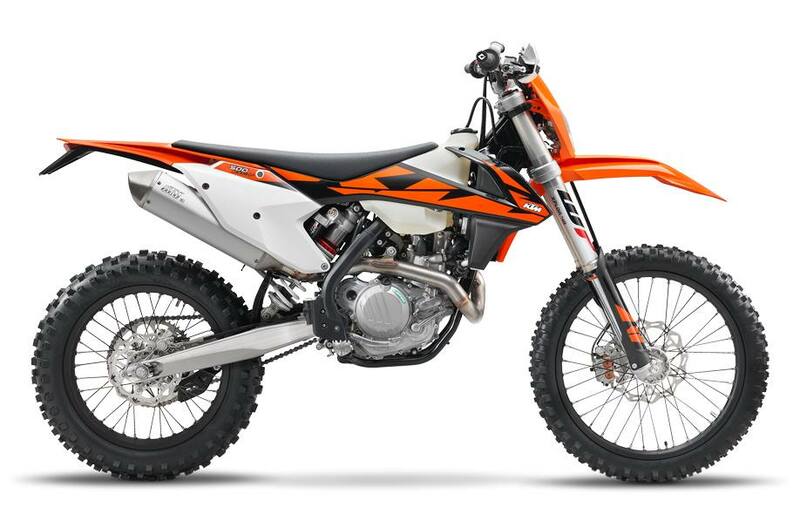  “No Dirt” footpeg design keeps the pegs pivot from becoming clogged, ensuring the footpeg is always in the correct position.  CNC machined hubs, high-end Giant rims and Continental TKC-80 tires for maximum strength and traction on and off the road.  Airbox and filter design provides maximum performance with fast “no tools” air filter changes.  Bodywork with perfect ergonomics and contact points for maximum control and comfort.  Cooling system features stiffer radiators with better cooling efficiency while new radiator guards provide crash protection.  “No Dirt” shift lever prevents dirt from fouling the lever joint to ensure proper shifting in any condition.